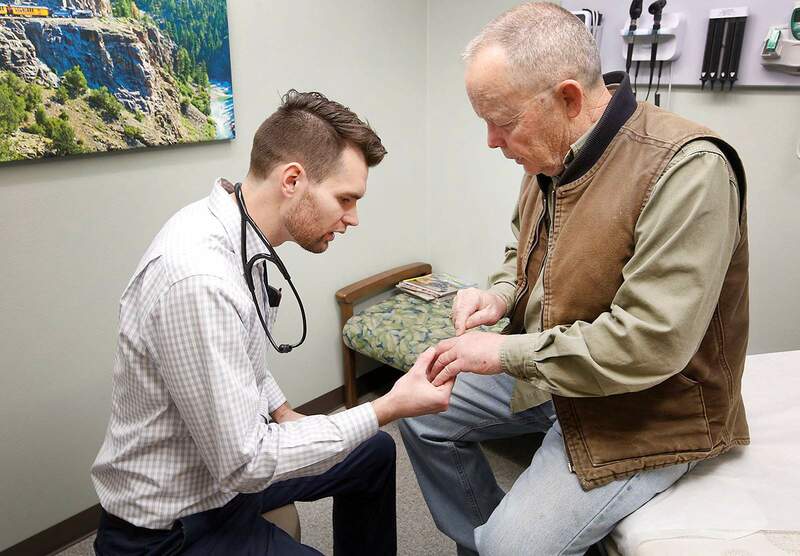 Matt Dillon, a third-year medical student at the University of Colorado School of Medicine, looks at Joe Wray’s swollen hand in February at La Plata Family Medicine. The Southwestern Colorado Area Health Education Center provided housing for Dillon while he worked in town for two months. The housing is part of statewide effort to recruit future physicians to rural areas. Matt Dillon, a third-year medical student at the University of Colorado School of Medicine, laughs with Caitlin Sibley, left, a medical assistant, and Amy Ross, an EMT, in February at La Plata Family Medicine. Dillon spent two months working at the office and felt he got a good taste of small-town life. As the nation faces a looming shortage of doctors, rural areas such as Southwest Colorado, could be particularly susceptible. A local organization and similar groups across the state are working to combat the problem by providing students the opportunity to work in rural settings and dispelling misconceptions about rural health care. “Sometimes, people who grew up in the city think our small towns are like going to a Third World country,” said Kathleen McInnis, executive director of the Southwestern Colorado Area Health Education Center. Much of rural Colorado, including the southwestern corner, is already short of physicians, and across the state, the problem is projected to get worse. The Association of American Medical Colleges estimates the U.S. could be short between 40,800 and 104,900 total physicians by 2030. Colorado could be short 800 primary care doctors by 2020 and 1,700 by 2030, according to projections by the Robert Graham Center. Primary care doctors are in high demand because they have the widest training and broadest skills, said Dr. Mark Deutchman, director of the Colorado Area Health Education Center Program Office. “In small areas, it is impossible to support a range of limited subspecialists, who won’t have enough business within their narrow subspecialty to support them,” he said. When a rural physician moves or retires, it takes much longer to find a replacement than it would in an urban setting, Deutchman said. 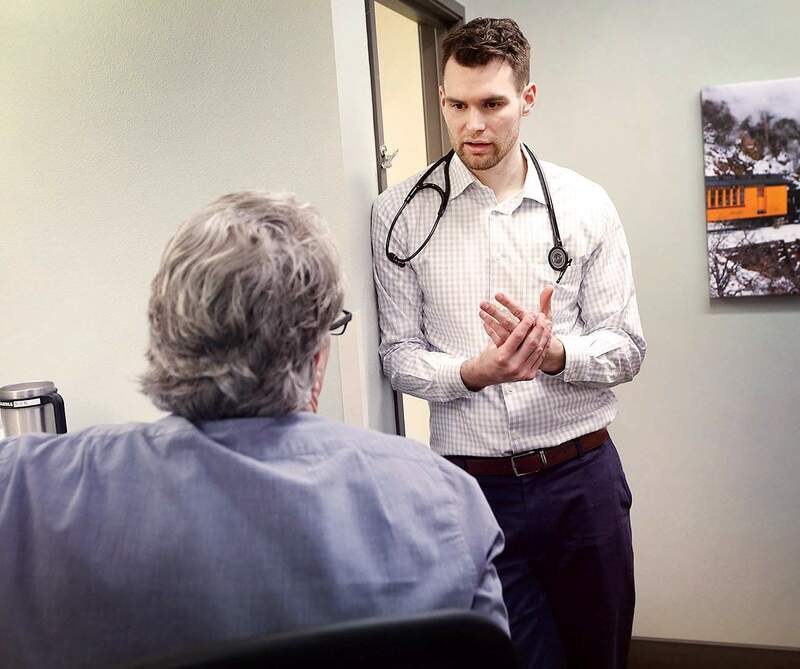 Matt Dillon, a third-year medical student at the University of Colorado School of Medicine, talks with Dr. Brad B. Lyons about a patient they saw in February at La Plata Family Medicine. The Southwestern Colorado Area Health Education Center sets up housing for medical students and students in other health professions such as nursing, physical therapy and pharmacy so they can experience working in a rural setting. Rural doctors tend to be older and closer to retirement. At the same time, the areas they serve are drawing in older, retired people, and as a result, these areas have a growing need for health care, Deutchman said. Recruiting primary providers to small communities, such as Dove Creek, is tough because they are isolated, and these areas also tend to have higher rates of mental and chronic illness and poverty, McInnis said. “It just makes the work environment more challenging for providers,” she said. To encourage future health care workers to consider rural areas, McInnis’ center has between five and 10 students from several colleges in Colorado working in its eight-county region at any given time, she said. In addition to medical students, the center hosts students studying nursing, dentistry and pharmacy, among other health professions. In 2017, the Southwestern Colorado Area Health Education Center hosted 45 medical students. Centers across the state provide about 20,000 nights of housing for students in rural areas, Deutchman said. 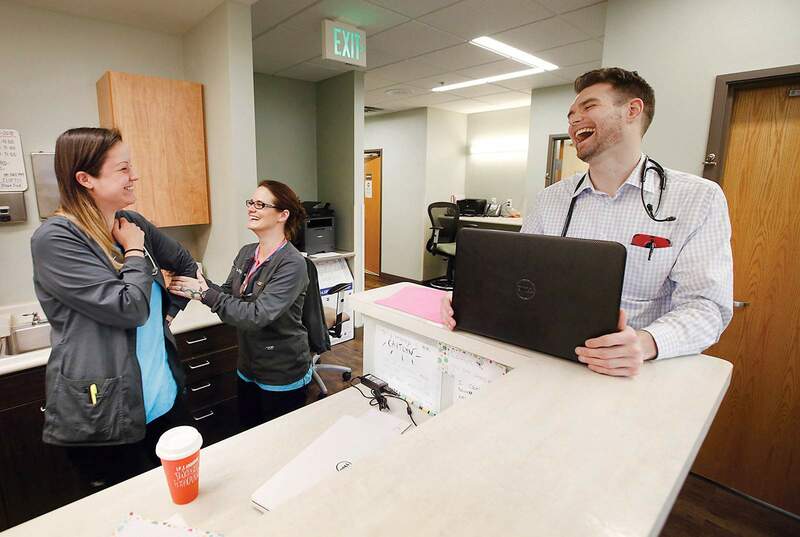 This year, the southwestern health center housed University of Colorado student Matt Dillon for two months while he worked at La Plata Family Medicine. His program requires that he spend one month in a rural setting. Dillon said he got a sense of Durango’s small-town flavor. He saw patients come back for follow-up appointments and around town at the grocery store and Durango Community Recreation Center, he said. Dillon, a third-year medical student, eventually hopes to be an emergency room doctor, and he can see himself working in a hospital similar in size to Mercy Regional Medical Center. That type of setting appeals to him because he would have the opportunity to provide a greater variety of procedures than he could complete in a larger hospital. To boost the number of people interested in rural areas, CU started a special track in 2005 focused on preparing students for rural work, said Deutchman, the program’s director. Dillon didn’t participate in this track, but he was well aware of the school’s efforts in this area. CU is one of 30 medical schools in the U.S. with a specific rural health care program, he said. Students in the rural track can attend lectures, labs and workshops to supplement their regular classes. They also usually spend four months or more working in a rural setting rather than one, he said. About 40 percent of the track’s graduates practice in small rural areas, which is a much greater percentage than the school overall, Deutchman said. Southwestern Colorado Area Health Education Center doesn’t have historical data on how many students have returned to work in rural areas after spending time in this region. But it in the last two years, it has started tracking that kind of data so staff will know going forward, McInnis said.